The Ford F-150 has been on the market for more than 70 years, so there’s no denying the pickup truck’s reliability. Furthermore, customers seemingly return to the nameplate, so engineers have clearly been doing something right. Therefore, the nameplate is actually an excellent choice for those pursuing a used vehicle. The F-150 delivers a whole lot of power via the various engine options, and the vehicle has consistently offered a whole lot of luxury and technology. Of course, drivers will also find a considerable savings on these used models, especially when compared to the new counterparts. For starters, used buyers will have to determine which kind of vehicle they want to pursue. When all is said and done, a used pickup is a perfectly logical option. These vehicles are more than capable of overcoming any types of obstacles they come across, making them an ideal choice for any type of drivers. Furthermore, by pursuing a used model, a driver may be more willing to test their used purchase’s full capabilities. This is rather obvious, but it’s still worth noting: a used vehicle is more affordable than a new vehicle. The sentiment makes sense. New pickups have less wear and tear than their used counterparts, and the limited mileage on the odometer adds more value to these new versions. Fortunately, drivers shouldn’t expect decreased performance or capabilities from these used pickups. Rather, buyers could expect their F-150s to act as new. For instance, a 2015 model should still operate is if it’s fresh off the lot, but drivers will find that a used model is considerably cheaper than any new equivalent. It may sound silly, but drivers often want to preserve their new rides for as long as possible. As a result, they may hold back a bit while operating the vehicle, and they may refuse to test the pickup’s full capabilities. With a used truck, drivers shouldn’t have these apprehensions. They’re likely expecting their used purchase to be somewhat temporary (even if it’s five to ten years), and they might not be as discouraged to push the pedal to the metal. Furthermore, if a buyer was planning on using their F-150 for the worksite, they may be less worried of any various dents or scrapes. We’ve naturally started pushing you towards Ford’s premier pickup truck. However, what attributes makes this particular nameplate stand out over other used trucks? Well, for starters, the F-150 provides unmatched power, making the truck an excellent choice for any type of driver. Furthermore, the luxurious interior will remind drivers of a much more expensive ride. Needless to say, it’ll be difficult finding another used pickup that offers as much as the Ford F-150. Whether you’re going to be relying on your F-150 for the worksite or just a standard commute, the pickup truck’s performance makes it an excellent choice. The engine options from the past two generations provided plenty of muscle, although it was the other mechanical inclusions that put the nameplate over the top. For instance, handling and braking have consistently been revised, thus providing drivers an optimal driving experience. Furthermore, the assortment of safety features will assure that your pickup remains in one piece, and they’ll also play a significant role in improving your overall commute. Drivers don’t often expect a whole lot of amenities from pickup trucks. However, Ford is clearly doing their best to buck that trend. The Ford F-150 has consistently rolled out some of the most impressive interior and exterior offerings in the entire class. For instance, the 2015’s exterior was highlighted by the distinctive LED mirrors found throughout the body, helping improve driver’s visibility. Meanwhile, the interior is highlighted by heated front seats and high-class materials. The real star of the F-150 (for more recent-year models) is the inclusion of a high-tech touchscreen infotainment system. So you’ve determined that you want a used Ford F-150. Well, that’s all well and good, but that’s easier said than done. The nameplate has been out since the late 1940s, so drivers have a whole lot of model years to choose from. 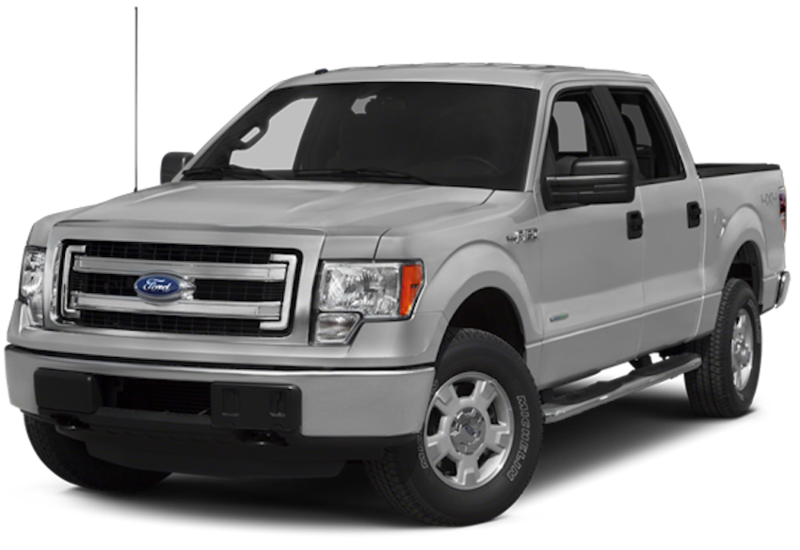 The F-150’s twelfth generation started in 2009, and it ultimately lasted for six models years. The intention of this grouping of pickups was to improve on the brand’s existing crop of full-size trucks. These F-150s included several ‘Super Duty’ attributes, like a giant grille and distinctive head lamps. Engineers even slightly revised the design, releasing both a two-door and four-door version of the nameplate. For the 2011 model year, Ford unveiled a pair of new V8 engines, including the 5.0-liter V8 (360 horsepower, 380 pounds-feet of torque) and the 6.2-liter V8 (411 horsepower, 343 pounds-feet of torque). The brand also released a new 3.7-liter V6 (302 horsepower, 278 pounds-feet of torque) and 3.5-liter EcoBoost V6 (365 horsepower, 420 pounds-feet of torque). All of the engine options were accompanied by an automatic gearbox. The twelfth generation of the Ford F-150 should be generally easy to come across. The brand sold at least 400,000 units from 2009 through 2014, including 753,851 vehicles in the final year of the generation! The thirteenth generation of the Ford F-150 hasn’t been out all that long, but we’re already willing to label it a reasonable used target. Considering this generation only kicked off a year ago, this sentiment will truly only apply to the 2015 model. Still, there’s no denying all the pickup has to offer. The vehicle keeps much of the same shape and dimensions, but engineers managed to cut close to 750 pounds from the curb weight. By switching from a steel structure to an aluminum structure, drivers were able to cut their weight considerably. This doesn’t only improve overall handling, but it also plays a role in the vehicle’s fuel efficiency. Meanwhile, to help accommodate this improved efficiency, the brand opted to make the 3.5-liter V6 engine (365 horsepower, 420 pounds-feet of torque) the standard choice for the F-150. Several other engine options were offered, with each of these systems accompanied by Ford’s six-speed automatic transmission. Perhaps most notable was the inclusion of the adaptive cruise control. This technology allows drivers to take a brief break without compromising safety. The pickup truck will help maintain your desired speed, and the built-in sensors will determine when your F-150 is approaching another vehicle too rapidly. In this scenario, the vehicle can automatically apply the brakes and even come to a complete stop! So a used F-150 is the proper choice, right? To knock the car-buying experience out of the park, a prospective buyer should head into The Faricy Boys in Colorado Springs, Colorado. The dealership offers an assortment of new and used vehicles, and customers will be hard pressed to find a better, more reasonable deal elsewhere. The business’s finance department will willingly work with your budget, and they’ll also provide some help to those with struggling credit. Furthermore, if drivers run into an issue with their used pickup, they can count of the service department to get the truck working good as new. While it may take a driver some time to settle on a used Ford F-150, it shouldn’t take them all that long to choose a dealership. If you live in Colorado, The Faricy Boys is the perfect choice.